His identity as an alien revealed along with his masquerading as Hank Henshaw, J'onn J'onzz tells the tale of how he saved the life of Jeremiah Danvers and came to become director of the DEO. At the same time, Kara tries to cope with most of the people of National City fearing her and considers revealing her secret as a gesture of good will, as Siobhan begins to plot against Kara for getting her fired. Granting that her father's rank probably helped expedite matters, it still seems incredible that Lucy Lane was able to reenlist in the Army (much less regain her old position) so quickly after quitting her job at CatCo. CatCo has a shocking lack of security - both in how there is no one to stop Siobhan from sneaking into the building in the early evening and in how Kara's work computer is open to her e-mail when she was out sick the whole day. Then again, Siobhan is kind of an idiot to think she can do what she does without being seen on the interior security cameras. How are lead-lined frames supposed to prevent Kara from using her x-ray vision? The glass would need to be lead-lined as well. There's one great scene early on in which Mehcad Brooks and Calista Flockhart have a conversation without a word being said as Cat's phone starts ringing and there is nobody else to answer it. The non-verbal acting in this moment is fantastic. David Harewood is fantastic throughout. He plays three different characters in this episode - the original Hank Henshaw, the version of Hank played by J'onn J'onzz and J'onn himself - and this hour is a fine showcase for how versatile he is at playing different levels. It's reminiscent of Stephen Amell's work on Arrow, playing different versions of Oliver Queen at different points in time and around different people. Though the dialogue is rather sexist, with Jeremiah Danvers basically saying "You don't need to save people - there's already a man to do that! ", the scene in which Kara's foster dad talks with her people's reactions to a young girl doing impossible things is a great improvement on the similar scene between Pa Kent and a young Clark Kent from the movie Man of Steel. J'onn is seen eating Chocos cookies in his cell at the DEO - a gift from Alex, who deduced they were his favorite. This is a nod to the comics, where Chocos were Martian Manhunter's favorite snack. At one point it was revealed that the affect of Chocos on Martian physiology mirrored that of addictive narcotics in humans. J'onn was able to cure himself of his addiction by using his shapeshifting powers to expel the mass of cells responsible for causing the addiction. In the comics, James Harper was the real name of a masked superhero called The Guardian. A Metropolis police officer in his day job, Harper created the identity of The Guardian to go after the criminals who couldn't be prosecuted legally. He was aided in his protection of the Suicide Slum neighborhood of Metropolis by a group of orphaned newspaper boys he adopted, who became known as The Newsboy Legion. The newsboys later grew up to become scientists, who started the comics book version of The Cadmus Project. The DCTVU version of James Harper is a Colonel in the United States Marine Corps. J'onn is seen to be visibly uncomfortable around the fire Jeremiah Danvers makes to keep himself warm at night. In the original comics, fire weakened Martians and made them unable to use their powers in the same way that Kryptonite depowers Kryptonians. The reasons for the Martian weakness to fire have changed several times over the years. Most frequently, it was a physiological weakness akin to Kryptonite. One story said that it was a psychological effect, as the Martian god of chaos took the form of a wild fire. Another said that it was a genetic flaw programmed into their race by The Guardians of the Universe in order to prevent The Martians from becoming an unstoppable race of conquerors. The DCTVU version of J'onn is uncomfortable around fire due to it reminding him of the fiery death of his race during the war between the White and Green Martians. This is also the reason for J'onn's weakness to fire in the New 52 DC Comics reality. Col. Harper says J'onn and Alex are both being taken to Project Cadmus. In the comics, The Cadmus Project was a genetics lab that devoted itself toward the creation of heroic alien/human hybrids. They also created a younger clone body for Jim Harper, allowing The Guardian to continue fighting crime with the vigor of his original youth. In the Justice League Unlimited TV Series, Project Cadmus was an initiative sponsored by the United States government to monitor metahumans and develop plans to neutralize the threat they posed. This version of Cadmus combined elements of the comics version of Project Cadmus, Task Force X (aka The Suicide Squad) and the covert organization Checkmate. James Olsen describes the DCTVU version of Project Cadmus as the reason why Superman won't work for the American government. He says that if the DEO is a prison, than Project Cadmus is a dissection lab. It's a genetic engineering facility that treats aliens like lab rats, weaponizing alien abilities for military purposes and using humans as guinea pigs. As in the comics, Kara cannot use her x-ray vision to see through lead. The DEO has Remote Outpost Probes that allow them to detect the presence of aliens on Earth. Henshaw uses a thermal tracker, which indicates that J'onn was active within a two mile radius of their current position. Jeremiah Danvers made Kara a pair of glasses with lead-lined frames to help her suppress her vision powers. Winn analyzed the typing speed and patterns on the hard drive of Kara's computer and determined it didn't match Kara but it did match Sibohan. J'onn: (smacking his lips as he eats) How did you know they were my favorite? Alex: You eat them at 3 am. Only your favorite will do at 3 am. J'onn: You have to stop these visits. Alex: I like taking care of you, for once. J'onn: My mission as Hank Henshaw was to protect you. J'onn: Not this one. Which is why I'm telling you, you have to distance yourself. Don't check in on me. Stop bringing me cookies. Just say you never knew about me. Say I betrayed you. Alex: I would never do that! J'onn: There has to be a reckoning, Alex. An alien lied and took command of a government organization. This doesn't end with people getting fired or even going to jail. People get disappeared for this sort of thing. They're going to tear this place apart looking for whoever helped me. Alex: I'll lie. I'll convince. I will do everything that you taught me to do. But I am not abandoning you! This is rock bottom. And I know what kind of person I'm going to be. 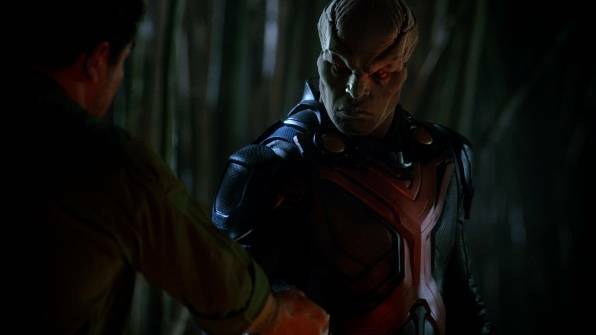 J'onn: I've dedicated my life to protecting this world and if you want to take me down for being different, so be it. Lucy: Why would I help you? You and Hank? Why do you all lie? Kara: When you're an alien and you've lost your world and you're dropped into a new one? You don't have a choice. Kara: I know you're feeling betrayed and alone. But if you go along with Jim Harper, just to feel like you fit in? To feel like you belong somewhere? Ultimately, the only person you're betraying is yourself. It wasn't easy for me to show you who I really am. But I did it because I trust in who you are. Who you really are under that uniform. And I trust you'll do the right thing. Cat: I don't have very many regrets, Siobhan, but I do regret firing you the first time. I wish to God that I could fire you again. With feeling. Jeremiah Danvers: I know you were only trying to help. But the world already has a Superman. All you need to be is Kara Danvers. Lucy Lane has been reinstated to her position as a Major in the United States Army. J'onn apparently was hiding in the Peruvian Amazon, where the local natives thought that he was Supay - the Inca God of Death. J'onn does not have a physical weakness to fire but is uncomfortable around it due to the fiery death of his race. Superman reportedly described J'onn as the most powerful being on Earth. J'onn has regenerative powers - presumably a function of his shape-shifting allowing him to reshape the damaged areas of his body. Jeremiah Danvers died saving J'onn from Hank Henshaw. He was able to throw Henshaw off a cliff, but not before being fatally stabbed. Col. Jim Harper was the best friend of the original Hank Henshaw. J'onn is over 300 years old. Cat Grant is friends with Princess Kate Middleton. Alex Danvers was recruited by J'onn for the DEO three years ago. Kara reveals her secret identity to Lucy Lane. Kara began working for Cat Grant two years ago. J'onn has refined his control to where he can erase memories more precisely with his telepathy. As a result of this, he accidentally discovers that Jeremiah Danvers is alive at Project Cadmus. Alex and J'onn go on the run, determined to find Project Cadmus and rescue Jeremiah. Col. Jim Harper resigns his position and insists on Lucy Lane being placed in charge of the DEO. At the end of the episode, a drunken Siobhan falls off a roof and is able to save herself as her scream turns into some form of sonic blast that allows her to levitate. The Peruvian Andes, on the border of the Amazon jungle. Midvale Junior High School in the city of Midvale. Jeremiah Danvers argument against Kara trying to help people boils down to "Superman is already doing that sort of thing, you silly girl!" A rushed episode that seems to be doing too much while simultaneously ignoring several urgent plot lines (i.e. the public no longer trusting Kara) in favor of a series of flashbacks that offer some much needed development to several characters who are quickly ushered out of the series. Still, if this turns out to be the back-door pilot for a Martian Manhunter solo series, I'll cope.